Maungdaw, Arakan – Several attacks on Rohingya civilians by the Myanmar Army and Air Force’s airstrikes left at least 12 killed and 50 injured. Many houses were burnt down in the attacks. Today, November 12th, 2016 at 6:30AM the military besieged Myaw Taung village and then shot with launchers continuously. That caused many injuries to children and elderly Rohingya villagers and many houses were burnt down. The villagers tried moving to Yay Khae Chaung Khaw Soe village to escape the bombardment but the military followed them and attacked again. The soldiers have been said to have torched the remaining houses in the village which were not destroyed in the initial attack. At 10AM the military rounded Pwint Phyu Chaung (Zarmaina) village and did similar attacks done to Myaw Taung villagers. Many innocent children and elderly were injured and many houses have burnt down. Again, the remaining houses were torched by soldiers when the villagers escaped to Yay Khae Chaung Khwa Sone village. At 2:30PM the military besieged Yay Khae Chaung Khwa Sone and Dar Gyi Sar villages. They started non-stop shooting with launchers. In both villages many innocent villagers were injured. The soldiers torched many houses, mosques and religious schools (Madarasas), a villager told RB News. As the military is continuously attacking unarmed villagers, the villagers themselves couldn’t tolerate any more and they started trying to defend themselves by holding sticks and slingshots. At least 10 Rohingya were closely shot dead by soldiers while the villagers tried to defend themselves. 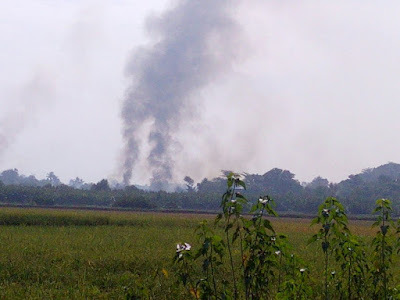 The villagers from Yay Khae Chaung Khwa Sone and Dar Gyi Sar were attacked again by Myanmar Air Force’s airstrikes when they fled to Thu Oo Lar village. The airstrike left many Rohingya villagers injured. Today at least 50 villagers injured from four villages and two died from injuries. “As we can’t leave from the area and blocked from any medical treatment, I am sure will die more.” a villager said. In the evening many Rohingya men were arrested while taking refuge on paddy fields. The villagers from four villages are on the run and have no food. The children and elderly are very much afraid of next attacks on them by Myanmar military. Today attacks by military on Rohingya civilians left at least 3000 homeless.